This week's brand new edition of the show celebrates not one, but four birthdays and I don't think Ben Ryan or Albert Von Tilzer have ever had their very own segments before. We'll also spotlight "Pops" (Paul Whiteman) and Sidney Arodin. In addition, we'll revisit some disasters (hoping this show isn't a disaster!) 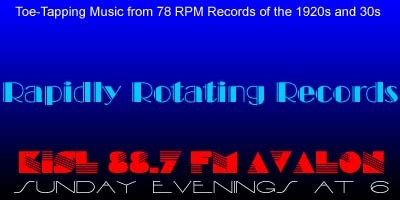 There are several records making their RRR debut including one by Bob Miller. Just click on the link below to instantly listen streaming online and/or download the show. Your comments, requests and suggestions for topic suggestions are always welcome. What's your favorite record this week? Enjoy! Melancholy – Joe Rines and His Triadors / Unidentified, v.
When We Get Together In The Moonlight – Nat SHilkret & The Victor Orchestra / Belle Mann, v.
Duet Stomp – Jones & Collins Astoria Hot Eight / Al Morgan, v.
Just A Little Drink – Paul Whiteman AHO / Billy Murray, Lewis James, Elliott Shoaw, Wilfred Glenn, v.
Wistful And Blue – Paul Whiteman AHO / Bing Crosby, Al Rinker, v.
When – Paul Whiteman AHO / Jack Fulton, Austin "Skin" Young, Al Rinker, Harry Barris, v.